The global hydration containers is gaining market traction with a remarkable growth throughout the forecast period primarily due to the increase in the demand from sports, kids and everyday end-use categories. Hydration containers are rigid containers made of plastic, metal, glass or silicon. Major hydration container product types include water bottles (mid-range and premium), tumblers, mason jars, cans, shakers and infusers. Hyper/supermarkets, independent stores and online (e-Commerce Companies) are the major sales/distribution channels for the hydration containers. Rising worldwide intolerance towards plastic (e.g. disposable or single-use bottled water containers create an extreme landfill problem) is influencing the consumer preference for hydration containers, especially containers made of metals. Single-use water bottles generate tons of waste every year, across the globe. More than 100 million plastics bottles are used every-day and 80 percent of them end up in landfills or oceans. Reusable water bottles, tumblers, and other hydration containers are the best alternative to disposable water bottles, tumblers and others. The materials used to manufacture reusable water bottles are metal, polymer, glass, and silicone. Metal and Polymer based reusable water bottles are widely used due to their high durability, recyclability and reusability. It is estimated that the increase in the consumption of reusable water bottles, tumblers, and other hydration containers may reduce the pollution and landfill problem caused due to single-use water bottles in the near future. The hyper/supermarket sales channel is expected to pose stiff competition to independent stores throughout the forecast period (2017-25). This is primarily due to the changing consumer preferences towards convenience shopping stores. The large retail stores also offer attractive discounts, which increase the chances of impulse buying. There is very high competition arising between online sales and these stores, as online shopping stores offer more convenience in low costs for reusable water bottles. Hyper/Supermarkets combined with independent stores is anticipated to represent a market share of 87.1% by 2025. The opportunities in the hydration containers market includes the growing demand for the metal hydration containers from fitness centers, academic institutions, corporate offices etc. in the APAC, Europe and the North America market for the promotional and other purposes. 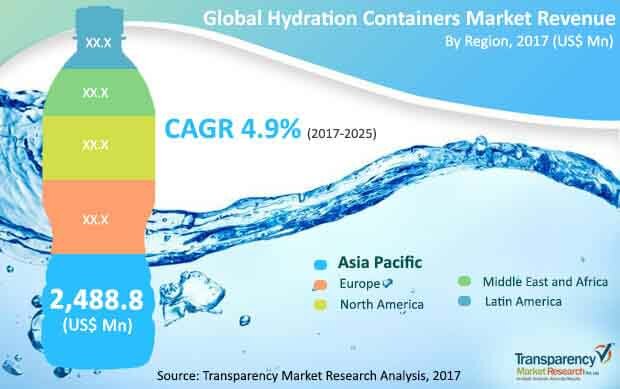 Countries such as China, Japan and India in the Asia-Pacific region is expected to have a major share of the global hydration containers market due to high penetration of reusable polymer and metal hydration containers. Metal hydration containers segment is expanding at a lucrative volume CAGR of 5.2% (2017-2027). Silicon and glass hydration containers together account for approximately 7.3% of the hydration containers market share, by volume. The Asia Pacific region is estimated to dominate the global hydration containers market, which is the fastest growing region globally. APAC hydration containers market is expanding at a healthy CAGR of 6.0% (2017-2027), by volume. China holds the leading position in the Asia Pacific region due to high production capacity and export of reusable hydration containers all over the world. Europe hydration container market is a matured market. France, Germany, and U.K. are the major contributors in the Europe hydration containers market. GCC region dominates the MEA hydration containers market. Due to extreme and volatile weather conditions, GCC region has higher demand for hydration containers. Africa faces the problem of lack of pure drinking water, which pushes the demand for reusable hydration containers. Demand for reusable water bottles and growing intolerance towards single use plastic water bottles and tumblers is the main driver for hydration containers demand growth in Asia-Pacific region. The global market has been segmented into five regions, i.e. North America, Latin America, Europe, Asia Pacific region (APAC), and Middle East & Africa (MEA). The Asia-Pacific region followed by MEA is, fastest growing hydration containers market, projected to register the highest CAGR of 6.3% and 6.0% respectively, during the forecast period. The Asia-Pacific hydration containers market is estimated to grow substantially by 120 basis points by the end of forecast period. The European region is estimated to account for second most prominent region in the hydration containers market. Key players in the global hydration containers market include CamelBak Products, LLC. BRITA GmbH, Cool Gear, International LLC., Klean Kanteen, Inc., Tupperware Brands Corporation, Contigo, SIGG Switzerland AG, Aquasana, Inc., Bulletin Brands, Inc., Thermos L.L.C., Nalge Nunc International Corp., S’Well Corporation, O2COOL, LLC, Nathan Sports, Inc., Hydro Flask (a Subsidiary Company of Helen of Troy Ltd.), Zejiang Haers Vacuum Containers Co., Ltd., Emsa GmbH, HydraPak, LLC., Cascade Designs, Inc., and Product Architects, Inc. (Polar Bottle). Transparency Market Research examines the global hydration containers market for the forecast period 2017-2025. The primary objective of the report is to identify opportunities in the market and present updates as well as insights pertaining to various segments of the global hydration containers market. This report provides forecast and analysis of the hydration containers market on global level. It provides actual data of 2016 along with estimated data of 2017, and forecast data up to 2025 in terms of revenue (US$ Mn) and volume (thousand units). The report also includes macroeconomic indicators along with an outlook on global hydration containers consumption pattern across the globe. It includes drivers and restraints of the global hydration containers market and their impact on each region during the forecast period. The report also comprises the study of current issues with end users and opportunities for hydration containers manufacturers. It also includes value chain analysis. Market numbers have been estimated based on extensive secondary and primary research, average pricing of hydration containers by product type and the revenue is derived through regional pricing trends. Market size and forecast for each segment have been provided in the context of global and regional markets. The hydration containers market has been analyzed based on expected demand. Prices considered for the calculation of revenue are average regional prices obtained through primary quotes from numerous regional hydration containers manufacturers, suppliers, and distributors. All key end users have been considered and potential applications have been estimated on the basis of secondary sources and feedback from primary respondents. Country demand patterns have been considered while estimating the market for various end users of hydration containers in the different regions. Bottom-up approach has been used to estimate the hydration containers market by regions. Global market numbers by product type, material type, by capacity, and by distribution channel have been derived using the bottom-up approach, which is cumulative of each country’s demand. The same has also been validated from top-down approach. Company-level market share has been derived on the basis of revenues reported by key manufacturers. The market has been forecast based on constant currency rates.